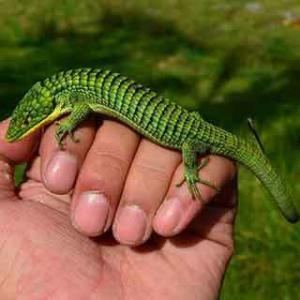 Abronia graminea for sale, is a diurnal, arboreal, medium sized, slender lizard with stunning colors and unique biology. One interesting feature of these beautiful lizards is their coloration. In general most wild animals are bright green with yellow around their eye and on their bellies. There is also known to be an eye color variation where some specimens have blue eyes and some have black with blue being more commonly seen in collections. Abronia graminea also have long prehensile tails and shed their skin whole the same way a snake does. One of the most important things when considering abronia enclosures is ventilation. Whether it’s an all screen enclosure or a glass terrarium with full mesh top, ventilation should be top priority when choosing housing. The reason for this is because abronia are quite susceptible to respiratory infections so they need a constant airflow to stop the humidity in the air from becoming stagnant. The high ventilation also stops any mould from growing in the enclosure. 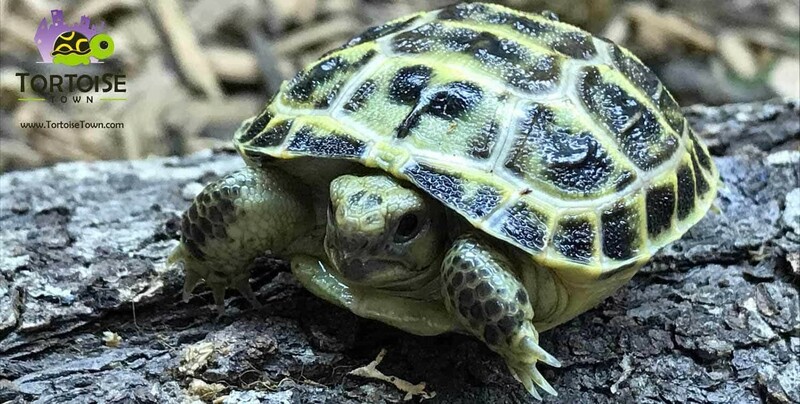 Our adult’s are kept singly in 0.45 x 0.45 x 0.9 meters (1.3 x 1.3 x 3 feet) enclosures and our younger abronia are kept in 0.4 x 0.4 x 0.6 meters (1.3 x 1.3 x 2 feet) enclosures. If you do choose to cohabit your abronia, we would suggest not keeping two males together. The reason for this is because males are very territorial and they are more than happy to fight off any other males who wander into their territory. Two females or a male and female will generally cohabit without any issues. When it comes to décor in a abronia enclosures we would suggest using live plants. Ficus and bromeliads are a firm favourite of captive abronia. Make sure you provide plenty of hide spots throughout the enclosure. Cork tubes and cork bark tied to the sides of the enclosure make ideal hide spots for abronia. We would also suggest stuffing the tubes with sphagnum moss. The reason we do this is to create little humidity spots for the abronia to hide In. using Sphagnum moss is one of the top choices for abronia graminea for sale keepers worldwide. Reason being is because it holds humidity well and the abronia often get amongst it too cool down if the enclosure becomes too warm. We use a 3 inch mixture of cypress mulch and sphagnum moss with our animals. If possible, add a drainage layer into your abronia enclosure. Contradictory to popular belief, baby Abronia lizard don’t live in swampy environments. A drainage layer stops the bottom of the abronia habitat from turning into such an environment. Decent hiding spots should be one of the top priorities in any abronia enclosure. Cork tubes are the number one hide of choice for captive abronia. As we previously mentioned filling some of the cork tubes with moss is an ideal way to create little pockets of humidity within the enclosure. Abronia often drink from the water droplets on the leaves or the sides of the enclosure left after you misted them. It never hurts to add a very shallow dish of water in the enclosure though. 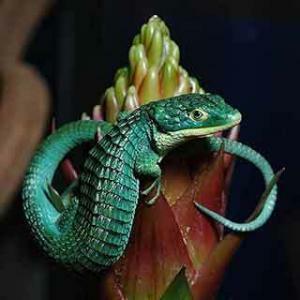 All of our abronia are kept under 10% tubular UV bulbs. 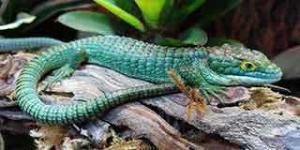 Like any other lizard though, It is a huge benefit for captive abronia if you can subject them to natural sunlight whenever the climate you live in allows it. A lot of U.S keepers generally keep their abronia outside and only bring them in for the winter months. Wild abronia live very high up so the temperature gradient changes very frequently. Our abornia are kept at daytime temperatures of between 23-26 °C (73-78 °F), we have found that our abronia are most active at around 26 °C (78°F). We let the night time temperatures drop to around 20-22 °C (68-71 °F). Abronia overheat very easily so it is recommended to never let your abronia enclosure go over 28 °C (82 °F) for a long period of time. This is particularly important for young abronia. Wild abronia often inhabit a cloud forest environment where humidity often reaches 80% and higher. Cloud forests are a misty and very foggy environment. We heavily mist our abronia enclosures twice a day, once in the morning and once and night. We have found that this creates an adequate humidity level. Try looking into commercially made “reptile foggers”.The fog created from these, is very much like the fog an abronia would witness in the wild. All of our abronia enclosures are kept within the 70 – 80% range, sometimes we let the humidity go up to 90%, but only for a short amount of time. We generally view our abronia as “look but don’t touch animals” whilst it’s not uncommon to meet calm adults. Juvenile’s and sub adults tend to stress very easily when handled, because of this we feel it’s better to just leave them alone and handle them only when its necessary. One of the most common mistakes new abronia keepers make is they feed their new lizard too much. Abronia are always hungry and will never turn down a meal, this has led the keeper to believe that their abronia is always hungry. It doesn’t take long to make a very healthy abronia obese through feeding them too much. 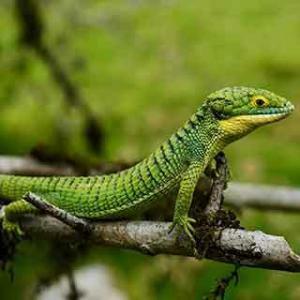 Abronia are insectivorous so a variety of gut-loaded roaches, crickets, locusts and as a occasional treat wax worms or mealworms, go down a treat. Gut-load the feeder insects with a variety of greens and veg (kale, spinach and dandelion are personal favourites of ours). We would also suggest lightly dusting the feeder insects once a week with calcium D3 supplement and then once every two weeks add a multivitamin powder to the mix. We tong feed our abronia 4/5 pray items each 2 to 3 times a week. The reason we tong feed our abronia is so we know they’re eating properly and to ensure that pray items aren’t getting lost in the enclosure. Much like a snake, abronia shed their skin in one whole piece. If the humidity in the enclosure is adequate you shouldn’t have any issues with your abronia shedding. Increased misting around this time can help aid with shedding. Spot clean daily and do full clean outs when necessary. 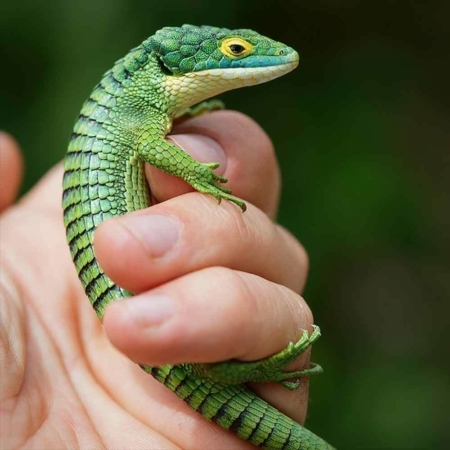 All of our abronia are kept in a bioactive environment. This means we use a selection of micro fauna as a “clean up crew”. The cleanup crew eat any waste left behind from the enclosures inhabitant; this effectively turns the enclosure into a mini eco system.